Collected rain water can be used to offset water needs in flower beds and garden plots. The system doesn’t have to be sophisticated. A simple barrel or trashcan under a roof line where rain water pours off will work. You’ll be surprised at how quickly the barrel fills. If you have rain gutters, you can set up a more elaborate collection system that can be piped to different areas of your yard. Even barns, chicken coops and other out buildings will produce a good amount of water during the rainy season. Remember – every little bit helps! Keep a pitcher on the kitchen counter to collect ice cubes and leftover drinks, then use on potted plants. Place a plastic bowl filled with soapy water in one side of the sink. Use this to wash hands throughout the day. At the end of the day empty the bowl on shrubs or trees. The small amount of soap used will not hurt the plants. When brushing your teeth, turn the water off until it’s time to rinse. Then only turn it on low. Keep a container of water in the fridge for a cool drink instead of letting the faucet water run until water is cold. 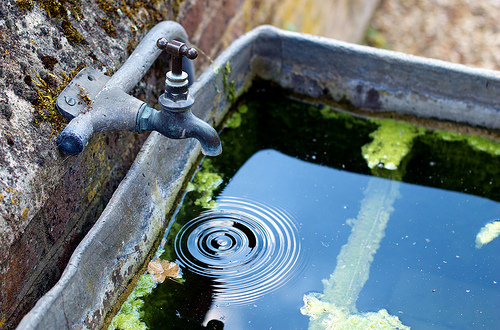 Check and replace garden hose washers to prevent leakage. Do not use running water to thaw meat or other frozen foods. Defrost food overnight in the refrigerator. When boiling foods in water, like pasta or potatoes, cool water when finished and use in the yard. Kitchen sink disposals use lots of water to operate properly. Start a compost pile as a way of disposing of food waste instead of using a garbage disposal. Garbage disposals also can add 50% to the volume of solids in a septic tank, which can lead to malfunctions and maintenance problems. If you are on a well, check your pump periodically. Listen to hear if the pump kicks on and off while water is not being used. If it does, you have a leak. Raise the lawn mower blade to at least three inches or to its highest level. A higher cut encourages grass roots to grow deeper, shades the root system and holds soil moisture better than a closely-clipped lawn. For added water savings, use grass clippings as mulch around plants to help retain soil moisture.